One of the leading educators in the Philippines was honoured at the University of New England’s Autumn graduation ceremony. Dr Gina Gonong received an honorary Doctor of Letters in recognition of the pivotal role she has played in developing professional teaching standards in the Philippines, making it the first country in Asia to define teacher career direction. She is an Associate Professor and Director of the Philippine National Research Centre for Teacher Quality (RCTQ) at the Philippine Normal University (PNU), designated by the Philippine Government as the National Centre for Teacher Education. 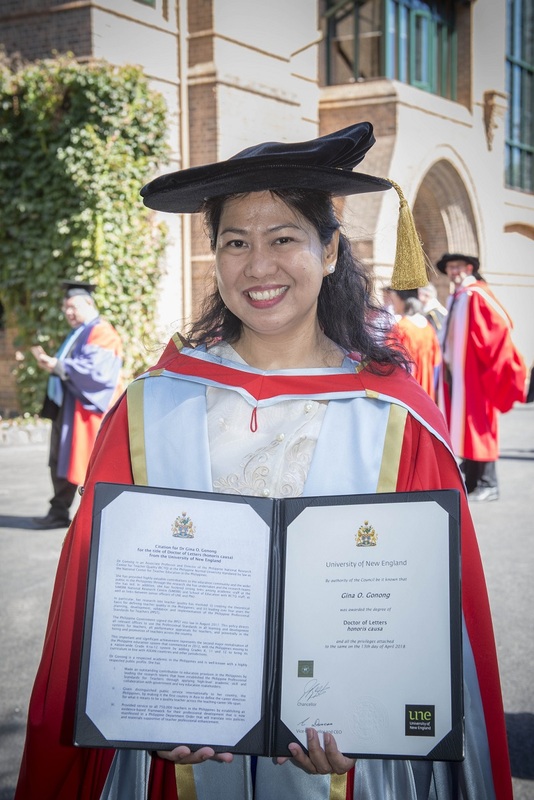 Dr Gonong has collaborated with the SiMERR National Research Centre, a UNE-based initiative to improve learning outcomes for students in regional and rural areas, particularly in the areas of science, mathematics and Information and Communication Technology (ICT). SiMERR grew out of the Centre for Cognition Research into Learning and Teaching (CRiLT) in UNE’s School of Education, and it has its headquarters at UNE. In nominating Dr Gonong, SiMERR founding director Professor John Pegg commended Dr Gonong’s “research skills, her leadership, her collaborative spirit, her determination and her passion to help give voice and bring reform to the more than 750,000 teachers in her country”. Dr Gonong has played a significant role in revitalising the Philippine education system as it has moved to a nation-wide Grade K-12 system to bring its curriculum in line with ASEAN countries and other international jurisdictions. Since August 2017, the Philippine Department of Education has directed that the professional standards be used in all teacher learning and development systems and performance appraisals, and will soon apply them to the hiring and promotion of teachers across the country.